Prepared in cooperation with the National Park Service (NPS). The U.S. Geological Survey (USGS) is studying coastal hazards and coastal change to improve our understanding of coastal ecosystems and to develop better capabilities of predicting future coastal change. One approach to understanding the dynamics of coastal systems is to monitor changes in barrier-island subenvironments through time. This involves examining morphological and topographic change at temporal scales ranging from millennia to years and spatial scales ranging from tens of kilometers to meters. Of particular interest are the processes that produce those changes and the determination of whether or not those processes are likely to persist into the future. In these analyses of hazards and change, both natural and anthropogenic influences are considered. Quantifying past magnitudes and rates of coastal change and knowing the principal factors that govern those changes are critical to predicting what changes are likely to occur under different scenarios, such as short-term impacts of extreme storms or long-term impacts of sea-level rise. 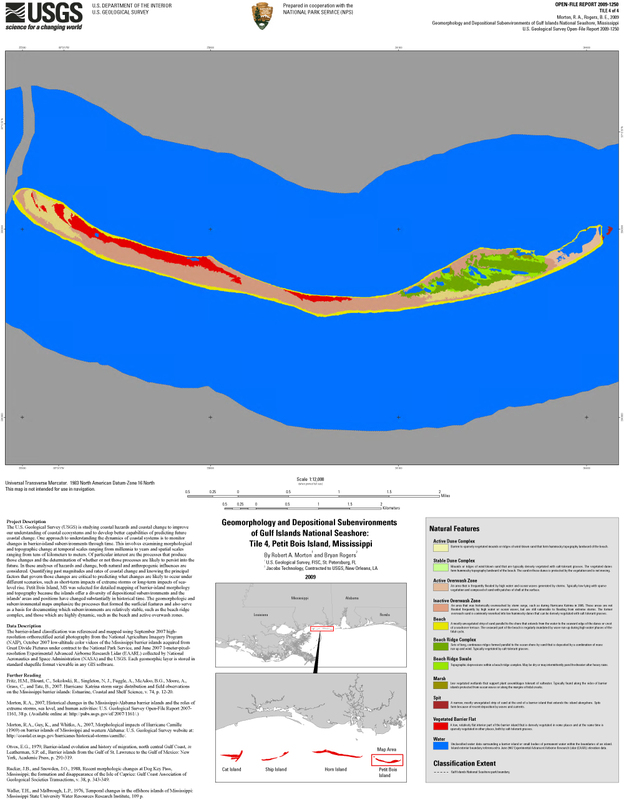 Gulf Islands National Seashore was selected for detailed mapping of barrier-island morphology and topography because the islands offer a diversity of depositional subenvironments and the islands' areas and positions have changed substantially in historical time. The geomorphologic and subenvironmental maps emphasize the processes that formed the surficial features and also serve as a basis for documenting which subenvironments are relatively stable, such as the beach ridge complex, and those which are highly dynamic, such as the beach and active overwash zones. The primary mapping procedures used supervised functions within a Geographic Information System (GIS) that classified depositional subenvironments and features (map units) and delineated boundaries of the features (shapefiles). The GIS classified units on the basis of tonal patterns of a feature in contrast to adjacent features observed on georeferenced aerial photographs. Land elevations from recent lidar surveys served as supplementary data to assist in delineating the map-unit boundaries. 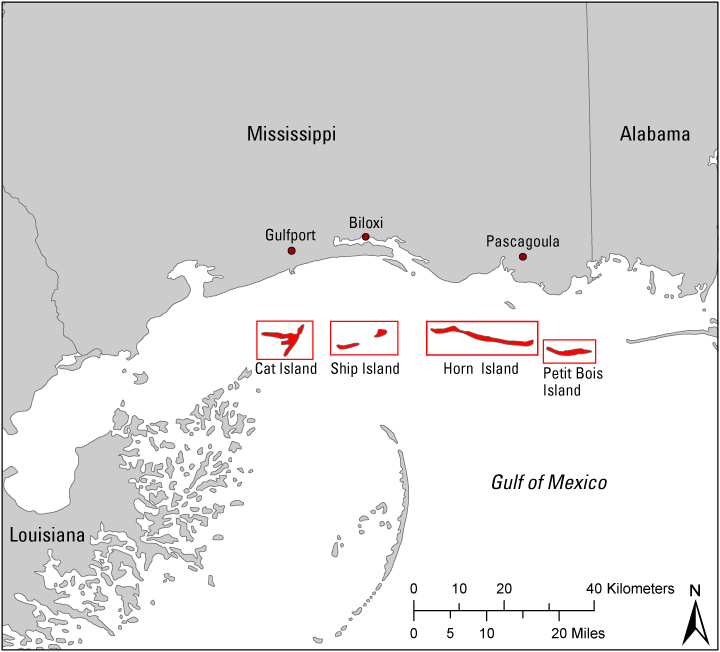 The Geomorphology and Depositional Subenvironments of Gulf Islands National Seashore, Mississippi, was divided into four individual map tiles,one for each island, and are provided as is in PDF format. For users of GIS software, the datasets are also available. Click on the links below to download the PDF map tiles or on the index map to view the map tiles in JPEG format. You will need to have the free Adobe Acrobat® Reader installed on your computer to view and print the high resolution PDF map tiles. 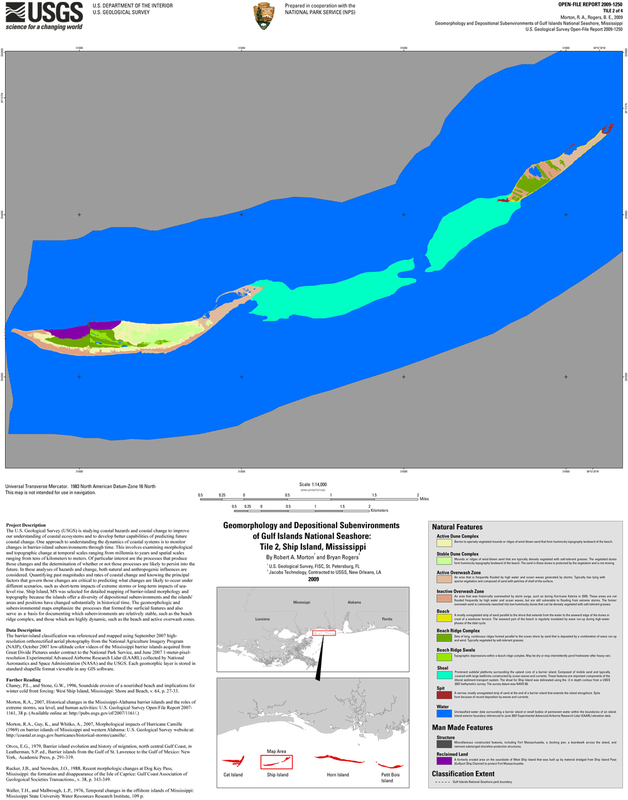 These datasets include shapefiles for each data-layer classification relevant to the individual island. 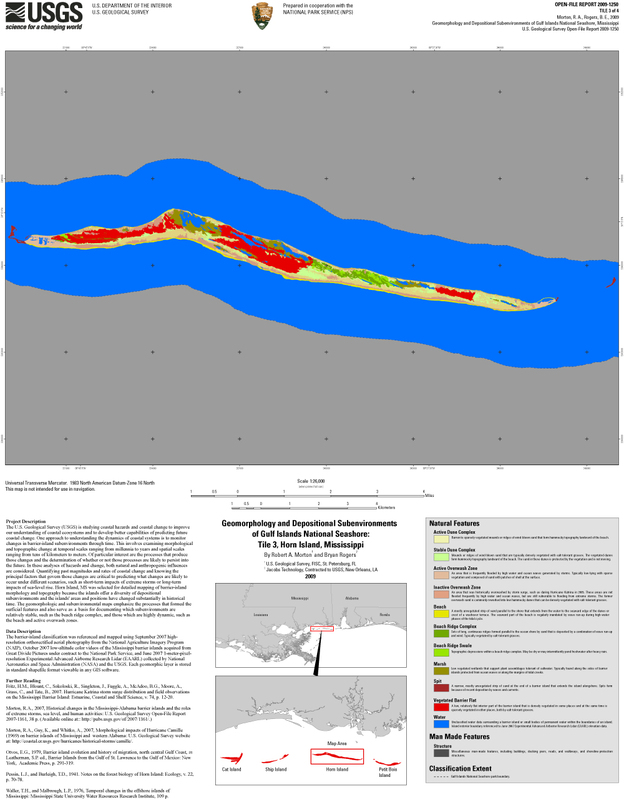 The barrier-island classification was referenced and mapped using September 2007 high-resolution orthorectified aerial photography from the National Agriculture Imagery Program (NAIP), October 2007 low-altitude color videos of the Mississippi barrier islands acquired from Great Divide Pictures under contract to the National Park Service (NPS), and June 2007 1-meter-pixel-resolution Experimental Advanced Airborne Research Lidar (EAARL) collected by National Aeronautics and Space Administration (NASA) and the USGS. Each geomorphic layer is stored in standard shapefile format viewable in any GIS software. Barren to sparsely vegetated mounds or ridges of wind-blown sand that form hummocky topography landward of the beach. Mounds or ridges of wind-blown sand that are typically densely vegetated with salt-tolerant grasses. The vegetated dunes form hummocky topography landward of the beach. The sand in these dunes is protected by the vegetation and is not moving. An area that is frequently flooded by high water and ocean waves generated by storms. Typically low lying with sparse vegetation and composed of sand with patches of shell at the surface. An area that was historically overwashed and flooded by storm surge, such as during Hurricane Katrina in 2005. These areas are not frequently flooded by high water or ocean waves but are still vulnerable to flooding from extreme storms. The former overwash sand is commonly reworked into low, hummocky dunes that can be densely vegetated with salt-tolerant grasses. A mostly unvegetated strip of sand parallel to the shore that extends from the water to the seaward edge of the dunes or crest of a washover terrace. The seaward part of the beach is regularly inundated by wave run-up during high-water phases of the tidal cycle. Sets of long, continuous ridges formed parallel to the ocean shore by sand that is deposited by a combination of wave run-up and the wind. Typically vegetated with salt-tolerant grasses. Topographic depressions within a beach-ridge complex. May be dry or may intermittently pond freshwater after heavy rain. Low vegetated wetlands that support plant assemblages tolerant of saltwater. Typically found along the sides of barrier islands protected from ocean waves or along the margins of tidal creeks. Prominent subtidal platforms surrounding the upland core of a barrier island. Composed of mobile sand and typically covered with large bedforms constructed by ocean waves and currents. These features are important components of the littoral sediment-transport system. Delineated from 2007 USGS bathymetric data. A narrow, mostly unvegetated strip of sand at the end of a barrier island that extends the island alongshore. Spits form because of recent deposition by waves and currents. A low, relatively flat interior part of the barrier island that is densely vegetated in some places and at the same time is sparsely vegetated in other places, both by salt-tolerant grasses. 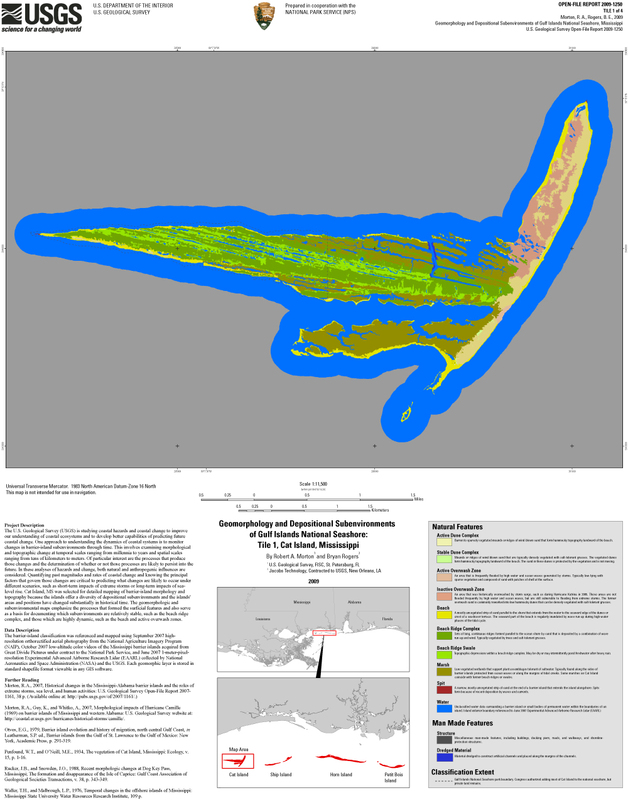 Unclassified water data surrounding a barrier island or small bodies of permanent water within the boundaries of an island. Island exterior boundary referenced to June 2007 Experimental Advanced Airborne Research Lidar (EAARL) elevation. Miscellaneous man made features, including buildings, docking piers, roads, and walkways, and shoreline-protection structures. Former land areas that were eroded and rebuilt by emplacement of dredged material. Material dredged to construct artificial channels and placed along the margins of the channels. The following links will open general metadata text files associated with each class shapefile for Gulf Islands National Seashore. View the more detailed Extensible Markup Language (XML) files, accessible in metadata readers such as ESRI ArcCatalog, from their respective folders in the Project Data sections listed above. West Ship Island, Mississippi: Shore and Beach, v. 64, p. 27-33. Shelf Science, v. 74, p. 12-20.
and western Alabama: U.S. Geological Survey website at: http://coastal.er.usgs.gov/hurricanes/historical-storms/camille/. from the Gulf of St. Lawrence to the Gulf of Mexico: New York, Academic Press, p. 291-319. Penfound, W.T., and O'Neill, M.E., 1934, The vegetation of Cat Island, Mississippi: Ecology, v. 15, p. 1-16. Pessin, L.J., and Burleigh, T.D., 1941, Notes on the forest biology of Horn Island: Ecology, v. 22, p. 70-78.
of the Isle of Caprice: Gulf Coast Association of Geologoical Societies Transactions, v. 38, p. 343-349. Water Resources Research Institute, 109 p.